And now we will get to today's cards using some of the Die-Cember dies. This card uses the new die called Bixby Arch Wafer Die. It has two dies in it and I have used them both on this card. The first is the curved floral design and the second is just a curved edge (you can see it below the flower border). I die-cut both out of white cardstock and then layered the floral over the plain edge. I then colored underneath the floral border with Copics so they would show through. I attached both of these cardstock pieces over a background I made previously (on this post here if you are interested in seeing how I made it). 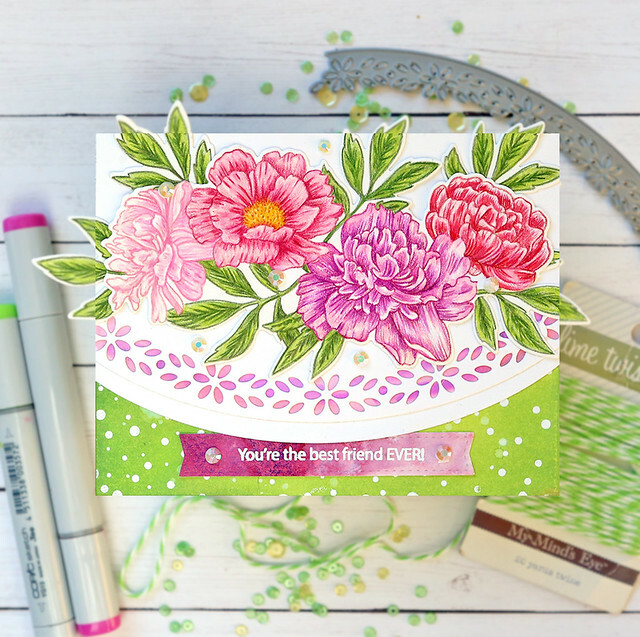 I stamped flowers from the SSS Beautiful Flowers 2 stamp set with MFT Natural Ink and colored them in with colored pencils. 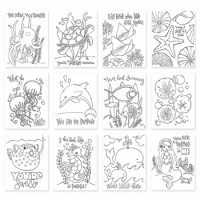 I stamped a sentiment from the SSS Messages for Everyday stamp set. I trimmed some of the flower bouquet leaves off and then slid them under the card a little so they didn't hang off the edges as far. I attached the sentiment banner under the border edge on the bottom of the card. I then added some PPP White Jewels to finish it. This card uses the new Tree Frame die. It works perfectly for a shaker card. I die-cut it twice from white cardstock. I covered the first one with White Blizzard Tonic Nuvo drops so it looked snowy. I also covered a slightly curved edge with the same drops for a snow bank under the tree. I left all of the inside pieces of the tree intact - you can really use it either way. I applied texture paste using the SSS Tiny Dots Stencil on the second die-cut piece. I trimmed the tree out of the square on this one. I applied foam tape to the backside and made it into a shaker window. I attached the shaker over a background I had made previously on the same post mentioned above (using Distress Oxide Inks). I used white jewels and clear sparkling sequins on the inside of the shaker window. 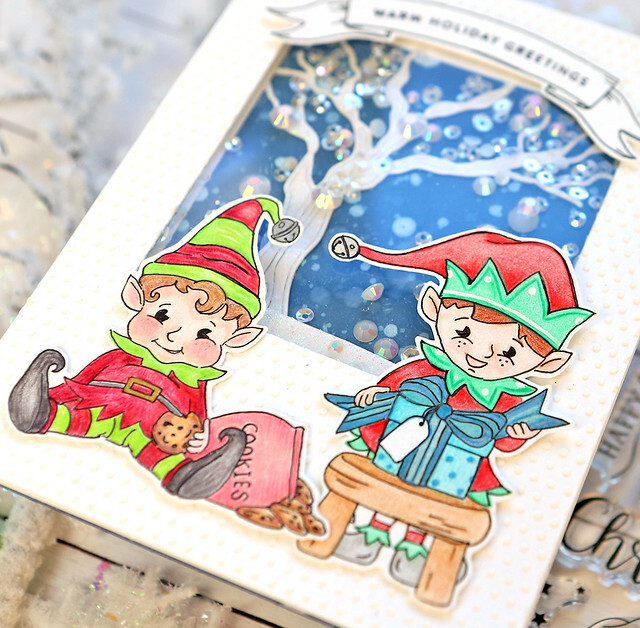 I stamped the Naughty and Nice Elves Stamps on white cardstock with MFT Natural Ink and colored them in with colored pencils. I then outlined them with a fine tip black marker. I used a silver Uniball marker for the bells and a white Uniball for details on the images. I attached these two on the bottom of the card overlapping the shaker window. I stamped the banner in the same stamp set with black ink and the sentiment with black ink. I attached that to the top of the card. I've been wanting to use this cute birthday stamp set since I got it a few months ago. It is called SSS Birthday Numbers. I used it on my last card as well - it is a really versatile stamp set that you (ME) would get lots of use out of. I stamped the numbers randomly over watercolor paper with white embossing powder and painted it with watercolors. I stamped the images of the balloons and the cupcake and stars with MFT Natural Ink and colored them in with colored pencils. I then outlined them with a fine tip black marker. I die-cut the new HOORAY die four times out of white cardstock and glued them together so it really stood up tall. 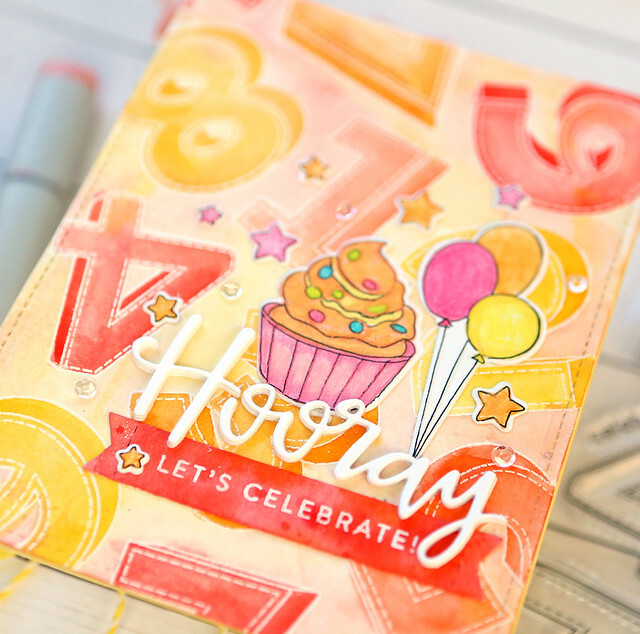 I stamped the rest of the sentiment (let's celebrate) on a watercolored banner with white embossing powder. I attached that to the card and then glued the Hooray die on top of it. I attached the other stamped images above the greeting. I added some sparkling clear 4mm sequins to finish it. I can't believe this is the first card I have made with the SSS Storybook Dies! I can't wait to make more as I just love how this one turned out! This new one is called the Big Picture Book Panda Die. I used the Big Picture Book Hugs die for the body of my Panda. I colored in the black portions of the panda with Copic markers. I added some cheeks as well. 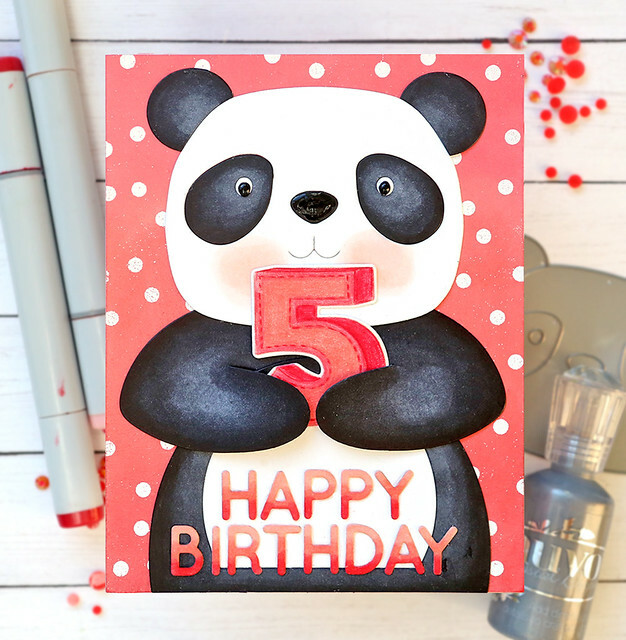 I attached Mr. Panda to a red background I had made before from that same blog post mentioned earlier (white embossing powder, Hello Bluebird Sprinkles background stamp, and Distress Oxide Inks). 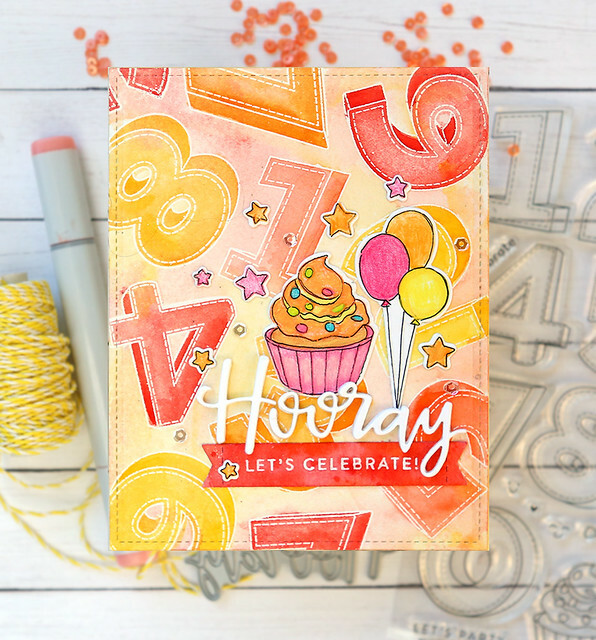 I stamped the number "5" from the same Birthday Numbers stamp set. I thought this big panda would be perfect for my little grand-daughters 5th birthday. I placed the number inside his hands and used foam tape to make the hands stand up a little. I used Black Nuvo Drops on the eyes and nose. I used the new Rounded Alphabet Small wafer dies for the sentiment - they are also part of the Die-Cember release. I colored them with Copic Markers and glued them to the bottom of his body. This is day one of a two day blog hop so go to the SSS Blog on Friday December 7th to have another fun day of inspiration! 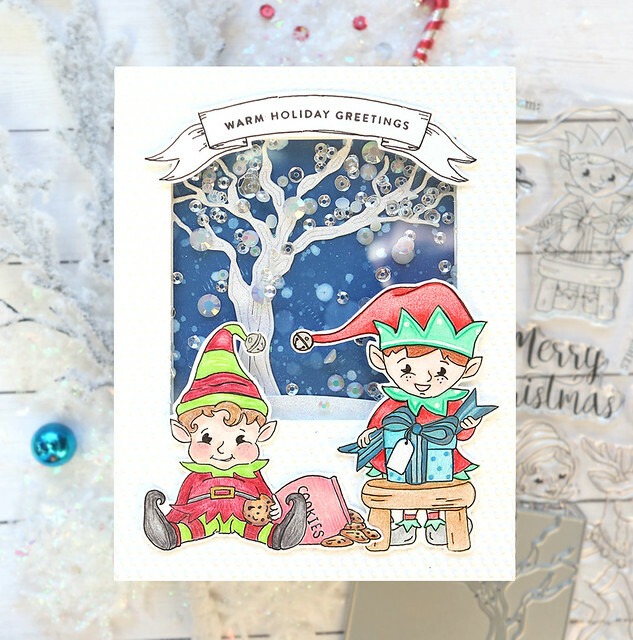 Please join SSS for a Facebook Live on Friday, December 7th showing the new release and some cards made with it and some special guests will be joining it live! Below are the products I used on the cards I made for this blog post all linked to the SSS store. I you want to see the full Die-cember release, it is HERE. Love your art. thanks for sharing. I really love the new Bixby Arch. It is grand. Die-cember is a lot of fun. Die-cember couldn't get any better. What a beautiful release! I love all the bixby dies. Soooooooo cute! Love the panda holding the "5" - so clever! Your panda card is great! So sweet!!! Wow, your cards are really great. Thank you for sharing your talent, and all the inspiration. Breath-taken-away by the works of art you've shared! 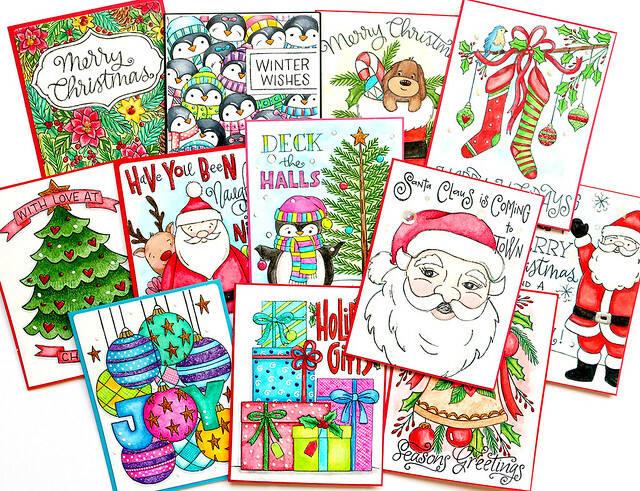 Fabulous cards... your coloring is always inspiring. I can't wait to give my grand kids some of your watercolor cards. They are so excited when I let them craft with me! These are amazing. Your coloring is beautiful. So many beautiful dies, beautiful cards! The tree frame die really looks great the way you used it. All of your cards are just fabulous, Suzy! 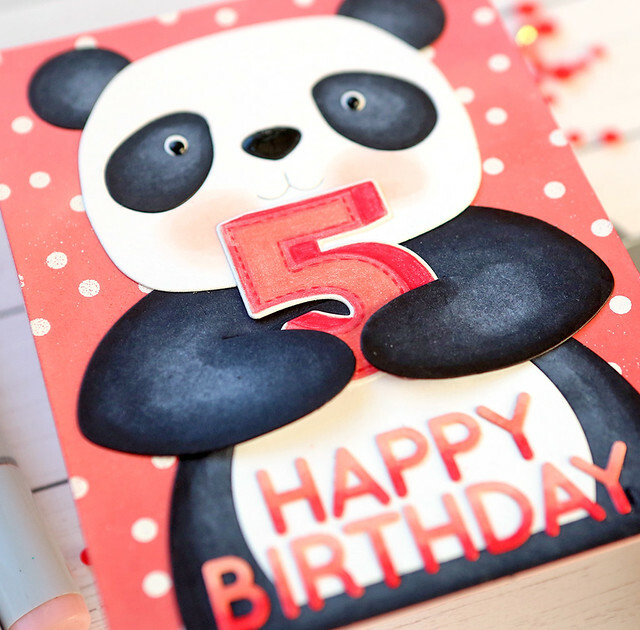 The panda is adorable and is perfect for a birthday card for little ones. 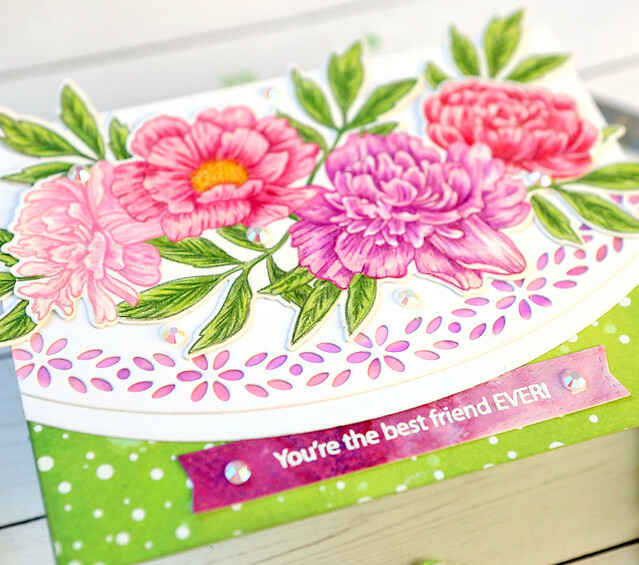 Love them all, but the Best Friend card is stunning! I LOVE THE PANDA SOOOOO MUCH!!!! What a great job! Love all your cards!! Your watercolor cards are super cute!! I love how colorful and cheerful your cards are! Wonderful cards! Love the tree frame die and how you turned it into a shaker card. wow what amazing cards - love them all!!!!!! So many wonderful cards, where do I start! I really like them all. Those cute animal images, and the christmas tree with the elfs! Too cute.